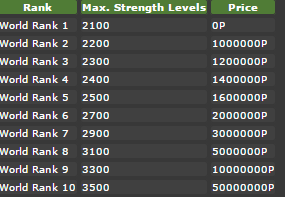 What is the highest World Ranking you can get on Pokemon Rumble Blast? I'm having trouble beating the top level of Axle Town and I figured that I would raise the World Ranking, but I wasn't sure how far it goes up, and I was kinda curious, too. Normally, as you progress through the game, you notice that the Pokémon you face and collect start going up in strength levels through the natural difficulty progression. However, what this causes is a vast amount of Pokémon being stuck at lower strengths, unable to face up against the opponents in the later parts of the game which occurred in the original game. However, in Pokémon Rumble Blast, after you have completed the main storyline, you gain access to the World Axle Upper Levels which has a special where you can rank up all the Pokémon in the world. This will change every Pokémon in every to be of similar strength levels, evening out the playing field so Pokémon of all species can fight in the final battles. To get the various ranks however, you need to pay and the price is high. Highest world ranking is 10. What are the best 3 Pokemon to beat "Dark Rust's Fort" in the bottom of the World Axle in Pokemon Rumble Blast? What is the starter on Pokemon Rumble Blast? In Pokemon Rumble Blast, can a Pokemon's power go up? Can pokemon evolve in pokemon rumble blast? How many pokemon can be obtained in pokemon rumble blast?